There are a few different modes for you to get your teeth stuck into, but you’re likely to start off in story mode. While the game does have a storyline it ultimately comes across as very generic and completely forgettable. It has something to do with an experiment gone wrong and a ragtag bunch of survivors working together to take out hordes of undead and demonic creatures. It’s a story that has been done a million times before and it’s difficult to really care about any of it. Thankfully this doesn’t turn out to be too much of an issue as the gameplay is entertaining enough that you’ll be too busy blasting through swarms of monsters to really want to know why you’re doing so. The game controls as you’d expect it to, with the left analogue stick being used to move around and the right used to shoot in any direction. You’ve only got a limited number of lives and you’ll lose one every time you touch an enemy or any kind of environmental hazard. 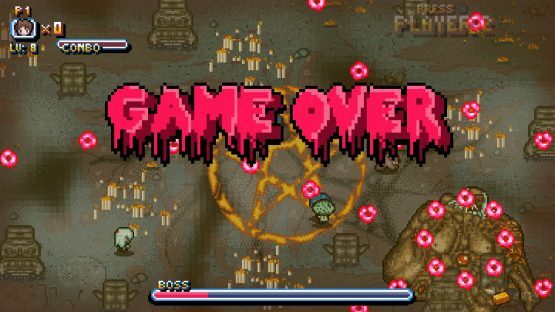 With how weak the weapons are early in the game, the Game Over screen will quickly become a familiar sight. Every time you die you’ll be taken back to a menu where you can use any gold found during your run to upgrade your character’s weapon. To start with it’ll take what feels like an age to kill even weak looking zombies, which is definitely not good when they start to crowd ’round you. But as soon as you level up a few times you’ll start to feel like you’re Sylvester Stallone in some cheesy 80s action movie, leaving a trail of dead enemies in your wake. Leveling not only increases the strength of your weapons, it also changes the appearance of your bullets so you get a nice visual reminder that you’re stronger. This RPG element does mean that early parts of the game can become a bit of a grind as you’ll end up replaying stages over and over until you’re strong enough to progress. Gold can also be used to unlock new characters. They all feel slightly different to control as they have different stats; some characters are very powerful but have a slower rate of fire whereas others will be quick and agile but will take longer to kill things. They also have unique skills like the ability to earn twice as much gold or start out with a higher number of lives. It’s fun to try out the different characters and see which one you prefer but of course this does mean that you’ll need to grind a lot of gold to unlock and then level them all. Each stage has a very different style and its own unique quirks. In the first stage you’ll be fighting your way through hordes of zombies on a road filled with trash cans and abandoned cars, which can be shot at causing them to explode and send your enemies to a fiery doom. You’ll also have to traverse your way across deserts and through laboratories filled with grotesque experiments. One particular highlight is one stage where you get to ride a motorbike as the screen constantly auto-scrolls to the left and you’ll need to dodge barriers in the road as well as enemies that are constantly shooting projectiles at you. It’s a nail-biting stage that makes you feel pretty awesome once you conquer it. At the end of each of the six stages is a boss fight. You’ll have to battle against giant demonic looking creatures that take up a large portion of the screen. It’s frantic but fun as you dodge their projectiles as well as just trying to avoid their limbs. Even when the screen is jam-packed with enemies the performance of the game holds up really well. I didn’t notice any annoying framerate drops at any point. Story mode isn’t the only thing to keep you entertained; there’s also an arcade and survival mode. In arcade mode you’ll be playing through all the story stages in one sitting. What makes it different to story mode is that you’ll always start out at level 1 and you’ll need to collect “level ups” as you slaughter enemies. Survival mode is exactly as it sounds, an infinite mode where the aim is to stay alive as long as possible. Both of these modes have online leader boards so you can check out how you compare against the rest of the world. The game also supports couch coop. It’s ridiculously chaotic and fun to conquer the swarms of demonic creatures with a friend sitting next to you. It’s also a good way to get through some of the early stages when you’re still pretty weak—two guns are better than one! 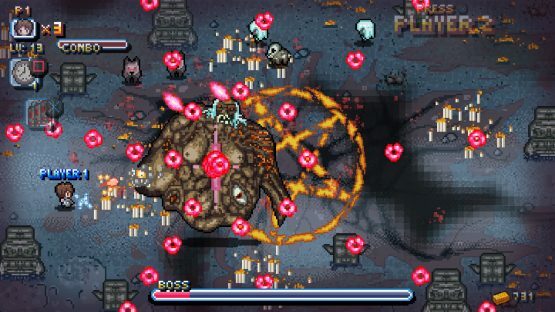 The pixel art-style and generic character design in Riddled Corpses Ex makes it a game which is fairly easy for people to overlook and dismiss as yet another bland twin-stick shooter. This would be a mistake though as the gameplay is surprisingly addictive. It’s especially fun when slaughtering tons of demonic creatures with a friend, and it has that “just one more go” feeling that will suddenly consume hours of your life without you realizing where the time has gone. 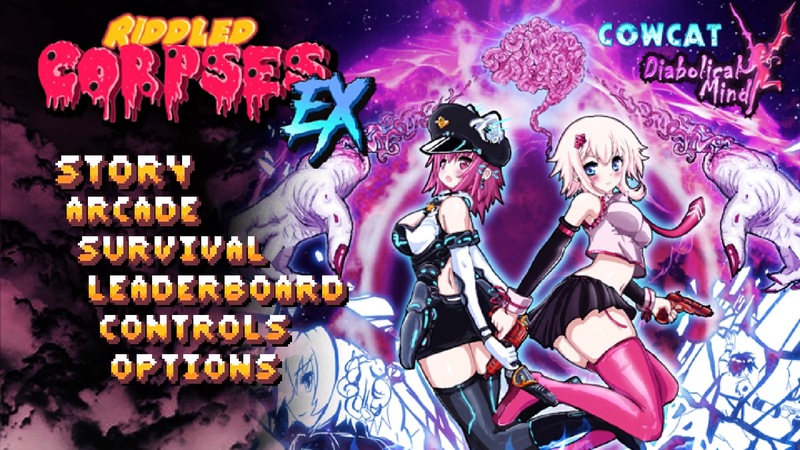 Riddled Corpses Ex review code provided by publisher. Version 1.01 reviewed on a standard PlayStation 4. For more information on scoring, please read our Review Policy here.